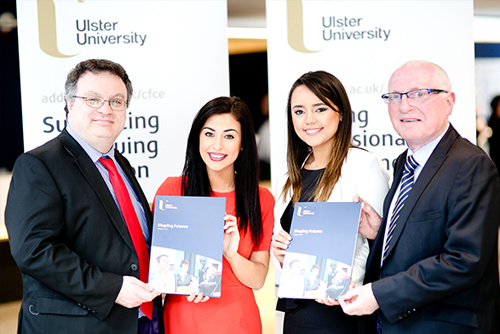 Employment and Learning Minister Dr Stephen Farry has congratulated Ulster University graduate interns on their recent achievements as part of a Professional Experience Programme supported by Northern Ireland employers. Ulster University offers students a six-month internship with employers across a range of key industry sectors. This enables the graduates to enhance key skills and apply their knowledge in the workplace, while employing organisations have an opportunity to access new talent and shape their future workforce. Speaking at the Ulster University Belfast campus, where the positive impact of the Professional Experience Programme was showcased, the Minister said: "This successful Ulster University programme gives graduates an opportunity to develop and enhance industry relevant skills whilst allowing employers, many of whom are SMEs, access to talented graduates who will help to support business growth. "Today's showcase demonstrates the significant benefits to both graduates and employers and I congratulate Ulster University and local employers on the development of this programme, demonstrating their commitment to the employability of graduates and supporting the local economy." Philip Bain, Managing Director of Shredbank based in Belfast, said: "Participating in the Professional Experience Programme was a fantastic business decision – allowing Shredbank to benefit from the up to date knowledge of graduates, as well as their fresh thinking and innovative approach to business development. "Strengthening the SME sector across Northern Ireland is vital to rebalancing our economy and programmes such as this are essential to ensuring that we have graduates with the industry ready skills that will help us succeed." Professor Alastair Adair, Pro-Vice-Chancellor, Provost of the Belfast campus at Ulster University said: "Ulster University is committed to providing students with the necessary experience, knowledge and skills that will shape both their own future careers and support the local economy, to which skilled graduates are integral. "We believe that the best way to achieve this is to work with employers to understand the skills and attributes they require in graduates and the Professional Experience Programme ensures employers can benefit immediately from the new ideas that graduates can bring." The Minister also contributed to a panel discussion on the important role of SMEs in the development of the economy and the added value that skilled graduates can make to these SMEs.